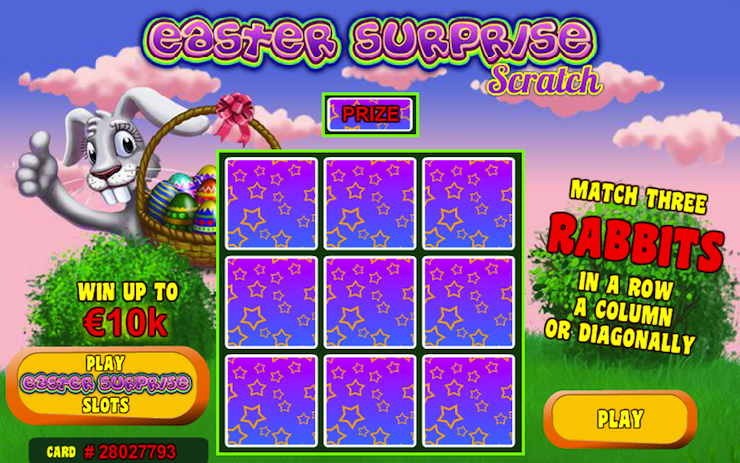 Easter Surprise is a scratch-card game available to play online in the Sports Interaction Casino. The main symbol on the Easter Surprise Scratch instant win game is the Easter Bunny with the other symbols being eggs of different designs and colours. In the background of Easter Surprise Scratch, you can see a grassy field with some bushes and the Easter Bunny giving a thumbs up while holding his Easter Basket full of eggs. This game features colourful cartoony images as well as a catchy background tune to get you in the holiday atmosphere. The card is set in a calming green field with a rather whimsical pink, cloudy sky. The main objective playing Easter Surprise Scratch is to line up three bunnies either in a horizontal line, vertically or diagonal. Although the bunnies are the only characters that payout, there are different coloured easter eggs that make up the other symbols in the game. Select your bet per scratch card by clicking + or – below Card Value. Click Shuffle if you want to choose a different scratch card. Note that you can shuffle the scratch card only up to three times during one game round. Click Play in the lower right of the game window to purchase the scratch card. Scratch the card. Click Scratch All to have the card scratched automatically. You can also play using the Autoplay function. Click + or – next to the Autoplay field to select the number of cards to be scratched consecutively. Clicking the play button starts the Autoplay function. During Autoplay the scratch card is scratched automatically. The active Autoplay session can be stopped by clicking the stop sign. The highest payout in Easter Surprise Scratch is 10,000X your bet. By matching three Easter Bunny symbols, you will win the prize listed above the scratch card. You can win up to $1,000,000 playing the Easter Surprise!